This blog consist of useful staff around Business Intelligence, Data Discovery, Operational Intelligence, Digital Intelligence, DWH, ETL, BigData, Data Science and Data Engineering. Traditional web analytics techniques were not designed for the breadth of channels, devices, and speed that fuels today's digital interactions. It is fundamentally inadequate to accommodate emerging channels, sophisticated consumers, technical challenges, and the democratization of analytics within data-driven enterprises. Because subpar analytics puts customer relationships at risk, Forrester has redefined the modern practice of web analytics as "digital intelligence." Welcome to the new world, world of Digital Intelligence or Digital Marketing Analytics. Organizations in the early stages tend to focus on user acquisition and measuring performance on marketing channels. Organizations extend the analysis efforts from effectiveness of marketing channels to overall impact of business through business performance analytics. As the organization matures, optimization of user experience on the site becomes embedded within the measurement initiatives. Web analytics tools and analysts are primarily focused on marketing analytics and business performance. Product/Site/Customer Analytics is the least served Analytics. Today’s product management teams need better access to data and insights to drive the best user experience on the site. Providing a good site experience is not only helpful in helping the visitors meet the visit goal, but also helps reduce cost as frequency of visit increases. Retained users are known to spend more on the site. User engagement and ultimately higher site conversion helps improve the search Quality Score for the site. Better search Quality Score helps boost SEO rankings and reduced spend for SEM. Google’s search algorithm has Quality Score as a key factor for calculating rankings. for mediums that users interact with the site, the importance to have access to granular data in real-time is becoming a requirement. Content or article going viral: Organization will strive to have insights into user interaction with the goal to increase visitor stickiness or visit depth. Mobile, social interactions to various content within the online ecosystem. Optimizing for inventory (physical or virtual) needs access to detail level data in real-time for understanding opportunities to improve the supply chain. Optimizing the experience in real-time and targeting customers with the right content will help with user experience and improve revenue. 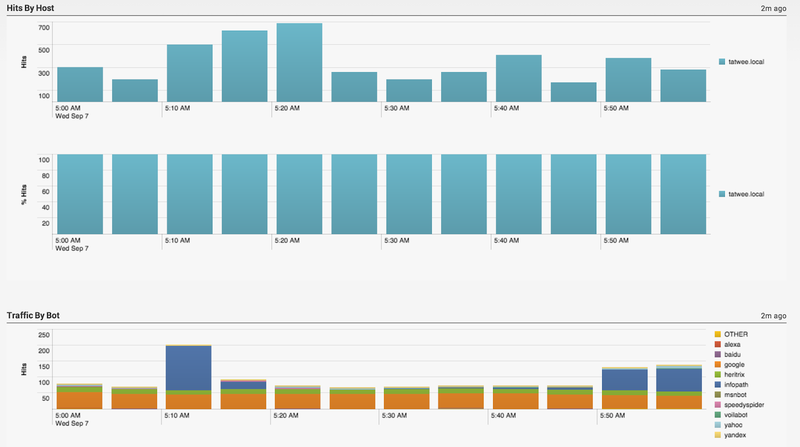 Additionally, site uptime is important for revenue and brand protection. Driving Digital Intelligence (DI) for the website is getting ingrained within IT organizations. DI provides all aspects to manage operations for your site. 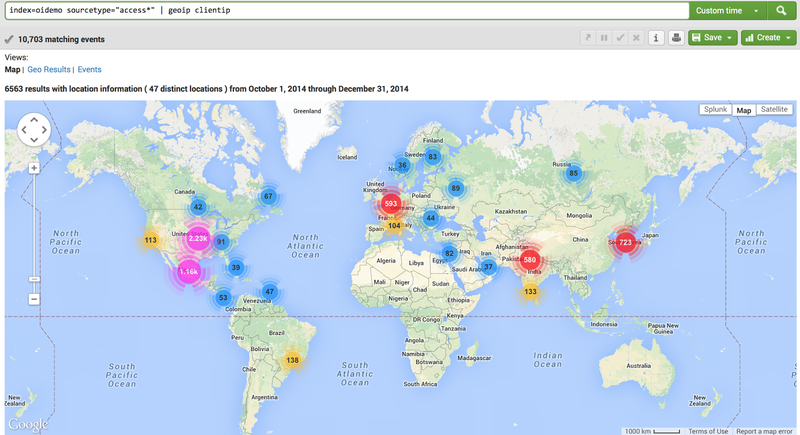 With build in dashboards and reports, all operational elements (page errors, stats by hosts, bot visits etc.) are available in real-time. Customers are interacting through multiple channels (web, mobile, social, offline, in-store etc.). 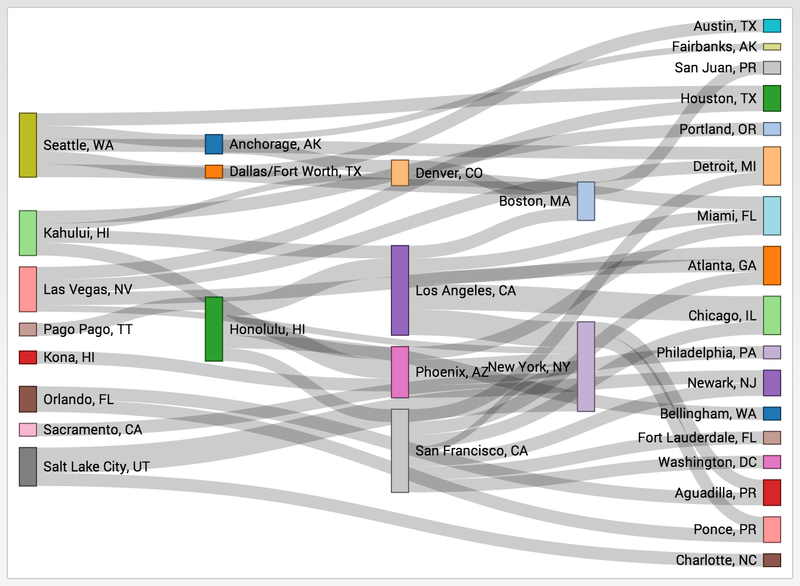 Multichannel analysis requires stitching data from multiple data sources. The data is a mix of structured, semi-structured and unstructured formats. Stitching this vast variety of data is not only expensive but also resource intensive. Organizations run multiple month data warehousing projects to stitch the data with limited to no success. Additionally, organizations have to spend enormous amount of resources to maintain these processes. Getting integrated views, with real-time data, are distant realities for the efforts. DI can take and stitch data from multiple formats and create integrated views without the overhead of resource/maintenance cost. Better analysis needs diving deep into the data, creating segments and doing segmentation on the fly. Traditional web analytics tools have limited segmentation capabilities and options. In most cases, analysts need to predefine segments. Data for these segments is only available after the segments are set. Historical processing of segments is not available. With DI ad-hoc analysis can be done very easily. Segmentation on the fly and ability to do n level segmentation with ability to look at how the segment performed historically is available out of the box. Finally, there is growing buzz about the term “Data Scientist”. Hillary Mason – Chief Scientist at bit.ly defines data scientist as “a data scientist is someone who can obtain, scrub, explore, model and interpret data, blending hacking, statistics and machine learning.“ In speaking to number of industry leaders, it is clear that data scientist spend an inordinate amount of time and effort obtaining, cleaning, transforming the data and preparing the data for analysis. Part of the problem is the variation in the data (unstructured, semi structured etc.) and part of it is volume. Using data that was gathering from DI sources can be used effectively to help the data scientist shift the focus on creating awesome analysis and searching business insights. Call volume has increased suddenly. Is it related to a campaign or is there is a sudden drop in conversion on the site that is driving a higher call volume? Do users calling into the call center spend more than from the site? For every x min reduction in hold time, what is the corresponding increase in conversion and revenue? Do some customers call and use the website at the same time? What is the impact of every dropped call on revenue? What is the impact of every extra 1 min hold time? 2. 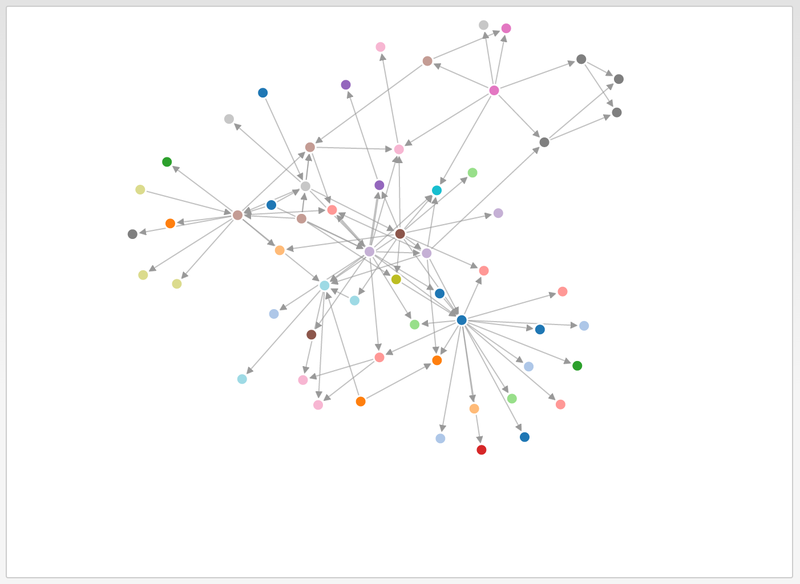 How can I create a 360-degree view of the customer who has interacted over multiple channels over a specific time period? 3. Can I get real time visibility into pages or properties within the site that are being used for converted users? Can I get the same for non-converting users? 4. Are there specific sites trying to scrape content or offers from your site? 5. Does showing the actual offer change the open rate for email and ultimately the conversion rate? 6. Can we build out a "what if" analysis for marketing or user attribution for web / telecom / social / mobile? Intelligence Server should be installed on its own dedicated server machine. MicroStrategy Web should be installed on its own dedicated Web server machine. The rest of the products can be installed in varying combinations depending on who intends to use them and on what machines. A MicroStrategy Enterprise Manager environment includes the statistics tables, the Enterprise Manager repository, and the Enterprise Manager project metadata. Each part of this environment needs to be upgraded. In a complete upgrade, you upgrade all Intelligence Servers, all projects, and Enterprise Manager to the latest version simultaneously. This is the simplest method of upgrading your MicroStrategy environment. Close all user connections, to ensure that no session activity exists on the Intelligence Servers being monitored by Enterprise Manager. 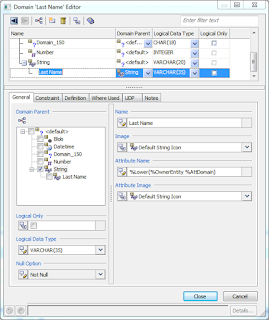 Using Operations Manager, run an Enterprise Manager data load. Make sure the Close orphan sessions option is selected. This data load ensures that the statistics tables are completely up to date and that all open Intelligence Server sessions are closed. If you do not run a data load before upgrading Enterprise Manager and the projects on the Intelligence Servers, you may lose access to some statistics data. Upgrade all the Intelligence Servers that are being monitored by Enterprise Manager to the latest version through Configuration Wizard. Update all projects on those Intelligence Servers to the latest version through Configuration Wizard. Shut down all Intelligence Servers that are being monitored by Enterprise Manager. Upgrade Enterprise Manager to the latest version. Create a backup of the statistics tables and the Enterprise Manager repository. These should be stored in the same database. MicroStrategy 10 includes major enhancements and updates to the Enterprise Manager project. As a result, older versions of Enterprise Manager projects cannot be used with MicroStrategy 10. However, when upgrading your Enterprise Manager project, your customized Enterprise Manager reports or other objects may be retained. Use the Project Duplication Wizard to make a backup of your existing Enterprise Manager project. For detailed information about using Project Duplication, see the Managing Your Projects chapter of the MicroStrategy System Administration Guide. From the Start menu, point to All Programs, then MicroStrategy Tools, then select Configuration Wizard. The Configuration Wizard opens. Select Upgrade existing environment to MicroStrategy 10, and click Next. Select Upgrade Enterprise Manager Project, and click Next. The Enterprise Manager Project Upgrade page opens. User Name: Type the MicroStrategy user name that can access and administer the Enterprise Manager project. Password: Type the password for the MicroStrategy user that can access and administer the Enterprise Manager project. 6. If you have an Enterprise Manager project package file (.mmp) to use instead of the default file, click Advanced >>. For the Package location field, click ... (the Browse button) to navigate to and select the package file. Functional testing verifies that functionality from the previous MicroStrategy version remains the same or improves after an upgrade to a new version. This includes various administrative tasks, as well as viewing, manipulating, and designing reports and documents. The best way is to run Integrity Manager and compare reports and etc. End users are the best source of day-to-day use cases for your MicroStrategy system. Because they are able to create accurate real-world testing conditions, end users must dedicate time to executing their test cases and report any unexpected behaviors. The functional end user testing period may encompass a few days or several weeks, depending on the size of your MicroStrategy system. After upgrading your system, you should ensure that the changes involved do not alter any of your report results. MicroStrategy Integrity Manager is designed to execute reports and documents from a project, note whether or not they execute, view their results, and compare them against reports and documents from another project. Execute the tests against the production data warehouse. If this is not possible, test against a data warehouse that resembles the production data warehouse as closely as possible. Execute the tests under production users, groups, and security roles, instead of specially-created integrity test users and groups, so that the tests match the production environment as closely as possible. Use prompt answers that are used in the production environment. 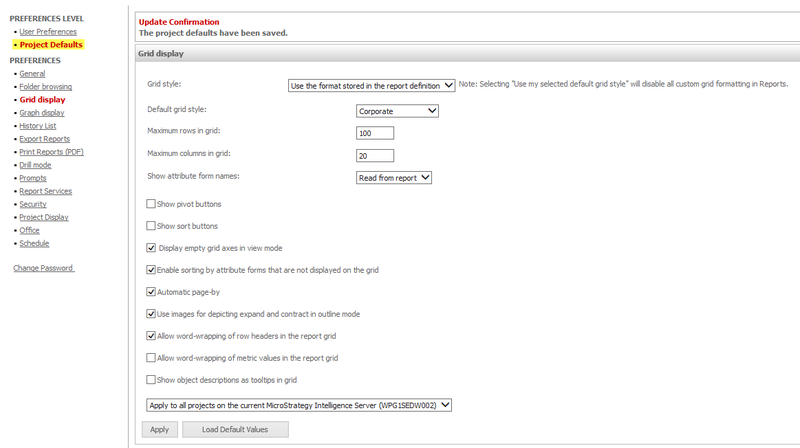 If you are upgrading from MicroStrategy 9.0 or later, use default personal prompt answers for prompts. Performance testing verifies that the response time, resource usage, and throughput in your environment meet the expectations of your end users. In the context of an upgrade scenario, the goal of performance testing is to verify that the system’s performance is maintained or improved by the upgrade. During a performance test, you should ensure that memory and CPU usage are within acceptable ranges. Load tests verify that the system is stable under normal usage conditions. Stress tests verify that the system is stable under high usage conditions. Capacity tests help determine the maximum workload the system can support while still meeting performance expectations. You can use Integrity Manager to automate your performance testing. Integrity Manager can record how long it takes to execute a report or document. It can also execute the reports or documents multiple times in the same test and record the time for each execution cycle to give you a better idea of the average Intelligence Server performance time. A single instance of Integrity Manager can execute a performance test that duplicates the effect of a user running multiple reports. This is suitable for load testing. If you are performing stress testing or capacity testing, you may need to distribute the load among multiple user sessions. To do this, you must run several instances of Integrity Manager, each executing a performance test. Make sure you have met the system requirements and other prerequisites for the current version of MicroStrategy, as noted in Reviewing upgrade prerequisites, page 11. Be aware of the level of interoperability between the current version of MicroStrategy and the version you are upgrading from, as noted in Client/server interoperability, page 2. Any errors in the upgrade process are likely to be written to the installation log file, install.log. This file is in the directory that you specify as the installation directory during the upgrade. When you use the Configuration Wizard to add tables to the metadata or update your projects, each SQL statement that is executed is logged to the Configuration Wizard log file, MACfgWiz.xml. This log file is in the Log subfolder of the main MicroStrategy directory. You can analyze the log file using a third-party log viewer, such as the Apache Chainsaw log viewer, which can be downloaded from http://logging.apache.org/chainsaw/index.html. If MicroStrategy Web users encounter errors after you upgrade MicroStrategy Web, you may need to clear your application and web server caches, or your users may need to clear their browser caches. For instructions on how to clear these caches, see the documentation for your web server, application server, and web browser. MicroStrategy recommends upgrading to the latest version without uninstalling the previous version of MicroStrategy. However, in rare situations, issues may be encountered as a result of an in-place upgrade. It is essential you take the time to assign and make changes to the many user permissions that affect your MicroStrategy system. Review the following for a list of privileges you should manually assign to users after upgrading MicroStrategy. In Developer, log in to a project source as an administrator. Once the upgrade process is complete, you should tune and optimize your MicroStrategy system for performance and stability reasons. For information about administering, maintaining, and optimizing your MicroStrategy system and projects, see the Tuning chapter of the MicroStrategy System Administration Guide. Our company currently uses Erwin Datamodeler Workgroup edition with Mart r8. This release doesn't support Oracle 12C. As a result, we are going to upgrade r8 to r9. Below you can find information about r8 and r9 architecture and action plan of installation r9 and upgrading of mart. CA ERwin Data Modeler Workgroup Edition provides a multiuser modeling environment that makes coordinated, large-scale modeling possible. It enables collaboration among project managers, data modeling team members, and standards administrators by providing workgroup modeling services, including conflict resolution, versioning, security, and standards management. You can coordinate the efforts of model teams to document existing systems, create new eBusiness systems, and drive data standardization. Model sharing encourages teamwork, so modelers can work together more efficiently to optimize model-based development. Your modelers get more work done in less time with better results. Earlier, when you upgraded to a new version of CA ERwin DM, only the schema was upgraded. To upgrade your models, you opened each model in the new version. This process took much of your time, especially when you had to upgrade large models. In CA ERwin DM Version 9.0, upgrading models is automated through the Mart Upgrade utility. The utility lets you upgrade not just models, but users, profiles, and permissions too. In addition, the utility also lets you upgrade to a different database. 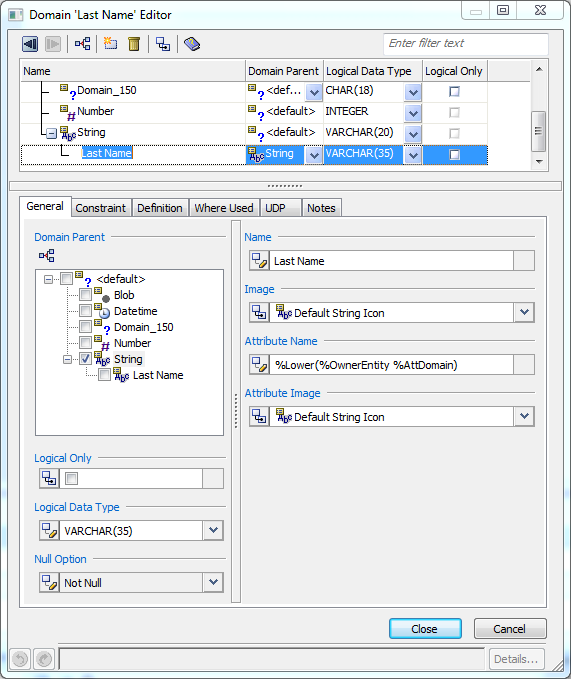 Separate logical and physical users: In the previous versions, Mart (or Model Manager) users required database level privileges to access Mart functionality. The Mart database administrators added or deleted users in the Mart database. This approach is changed now. The logical users are separated from physical users, so Mart Administrators can create Mart users without creating the corresponding database users. Authentication through Active Directory services: Earlier, if you wanted to provide access to a user group, you added each user individually. Now, because of the new architecture, you can use the Active Directory services and can provide access to the group. Anyone who is part of the group gets access. Mart administration outside CA ERwin Data Modeler: In the previous versions, Mart Administrators used CA ERwin Data Modeler for administrative activities such as permissions management. This required non-modelers to know how to use CA ERwin Data Modeler. In the new architecture, the administration component (CA ERwin Web Admin) is built on a separate layer on top of CA ERwin Data Modeler and is hosted on a Web server. Mart Administrators can access CA ERwin Web Admin from any computer and can perform administrative activities through a web console. You know the user name and password to connect to the database. You know the port number where Oracle is running. You know the name of the database. You know the IP address or the name of the computer where the database is running. You have created a data tablespace of at least 32 MB. You have created an index of at least 32 MB. You have created a temporary tablespace. You have assigned data tablespace as default tablespace to this user. You have assigned the temporary tablespace that you have created to this user. You have created the CA ERwin Data Modeler Workgroup Edition Installer role. You have granted Oracle privileges to the Installer role. You know the server name where you have installed the web server. For example, you know the computer name where Tomcat is installed. If you have changed the default port number, you know the port number on which the web server is running. You know the computer name where you have created the Mart database. You know the port number where the database is running. You know the database instance name if you are using SQL Server. CA ERwin Data Modeler has only been certified on the 32-bit versions of the Windows operating systems described in the preceding list. CA ERwin Data Modeler is a 32-bit application. You may experience problems running CA ERwin Data Modeler on a 64-bit operating system. CA ERwin Data Modeler is compatible with Microsoft Windows 8 Release Preview. You may experience problems with shortcuts and CA ERwin DM third-party components. If you want to use Microsoft IIS as the web server, you have configured it. The DBMS is installed and prepared for creating the Mart Database. The Mart database is created. At least one user with administrator privileges is present. If you are using Oracle, you have run the initial queries. For more information about the initial queries, see the Implementation Guide. Install the DBMS on the server where you plan to store the mart. For more information about memory and disk space requirements, see the system requirements for each DBMS (Microsoft SQL Server, Sybase, and Oracle). Use the DBMS features to create or identify the required storage objects and the mart. The specific requirements vary depending on your DBMS type. The Mart Server and Mart Admin war files are deployed on a Web server. You can either use an existing web server, or install the web server through the CA ERwin MartServer Installation Wizard. 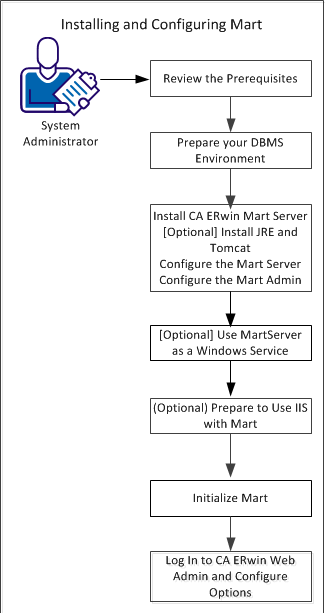 You must install CA ERwin Mart Server and configure it regardless of whether you use Mart Server as a Windows service. 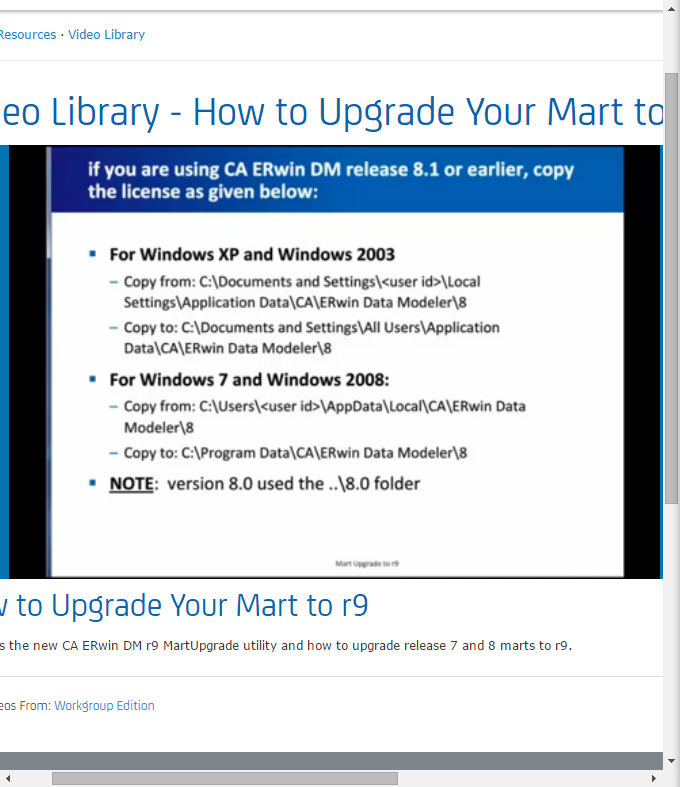 Download the Mart Server.exe file from the online CA Technologies product page and run it. The CA ERwin MartServer Installation Wizard appears. Go through the wizard steps to install CA ERwin Mart Server. Depending on the options you select, CA ERwin Mart Server and/or Java Runtime Environment (JRE) and Tomcat are installed. Note: If Java (any version) is already available in the computer and the environment variable JRE_HOME is set, the installer overwrites JRE_HOME with the new Java path. The JRE version that is shipped with the installer is 1.6.0_31. If a Tomcat web server is already installed in the computer and the environment variable CATALINA_HOME is set, the installer replaces CATALINA_HOME with the new path. After you close the wizard, from the Windows Start menu, click All Programs, CA, ERwin, ERwin Mart Server r9, Configure MartServer. Note: Use a new database. Do not specify the name of an existing database that you have used for an older version of Mart. Note: The following fields--Domain Controller Name, Domain/User Name, and Password are required only if you are using Active Directory authentication. The CA ERwin Mart Administrator and the Mart Server are configured. 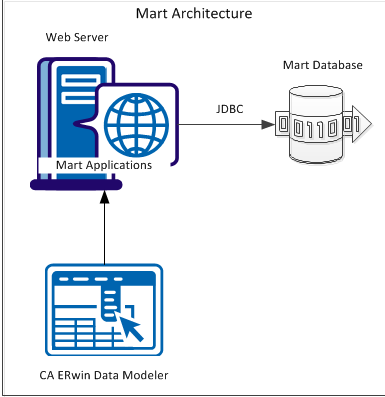 When you access the Mart database through CA ERwin Mart Administrator for the first time, you must initialize the database. Note: Before you proceed, verify that you have installed a DBMS and created the Mart database. If you are using Oracle, verify that you have run the initial queries. If the Mart is already initialized, the Login page appears. When you open CA ERwin Mart Administrator for the first time, the Initialize Mart web page that is relevant to your Mart database appears. From the Windows Start menu, click All Programs, CA, ERwin, ERwin Mart Server r9, CA ERwin Mart Administrator and log in. The CA ERwin Mart Administrator home page appears. Upgrade the top ‘n’ versions. Upgrade only the marked versions. Upgrade all marked versions and top 'n' versions. Upgrade all the versions of all the models. Regardless of the option you select, you can start working on a model after the model is upgraded. You do not need to wait until all the models are upgraded. The Upgrade Mart utility lets you pause the process any time and start again. When you pause, the utility completes upgrading the current model before stopping. When you restart the upgrade process, the utility continues from the point it had stopped. The utility then displays the models that are not yet upgraded in the list of models that you had selected. Let's look on particular example. For example, we can create new domain Last Name. It could be Student Last Name, Employer Last Name or etc. The advantage of domain that we can reuse one object many times. It is simply saves time and increases productivity and quality of data models. Recently, I got one request from user, that she wanted see 12 columns per page and she saw only 10. However, my user saw all 12. In order to fix it we should change prefernces - grid display. If we want to change it for all users, then we need login as administrator and then go to preferences. In preference level choose Projects Defauls. Now we can set properties for all users. Which is the best BI tool?